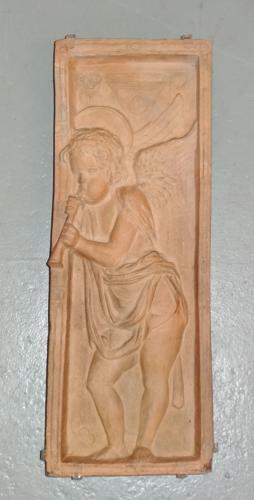 A beautiful early 20thC Arts & Crafts terracotta panel of one of the twelve angels (this one a musician) after the original bronze panels by Donatello. Nice heart detail to corners. The original bronze panels date from around 1447-9 and were produced for the High Altar of the Basilica of St Anthony Cathedral of Padua, Italy. The Victoria & Albert Museum in London have a complete set of 12 plaster casts executed by Raphael Pinti circa 1870. Also, we have since discovered that an identical panel (one of three) is above a George Walton fireplace at what used to be the Glasgow Society of Lady Artists, 5 Blythswood Square, Glasgow (see last two images). This panel has two incised signatures; one on the back; what looks like "TiDY 1913" and another "TiDY" on the front rebate border bottom left. Currently housed in a new temporary frame structure which can be easily removed.